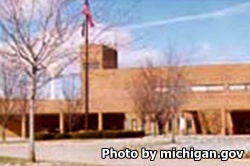 G. Robert Cotton Correctional Facility is located in Jackson Michigan. It is a mixed custody facility housing level I, secure level I, level II and level IV adult male inmates. Currently, this facility has a capacity of 1,974 inmates. Offenders are secured by three twelve foot fences covered in razor wire, armed guard towers, acoustic and electronic motion sensing detection systems, surveillance cameras and vehicle patrols. Inmates are housed in several different types of buildings from pole barns to mortar brick and steel, the security level determines the building. While incarcerated offenders can take adult basic education classes and earn a GED. Vocational programs provide training in the culinary arts, and general maintenance.